This application protocol describes a step-by-step protocol to isolate pure neural stem cells (NSCs) from the subventricular zone (SVZ) of adult mouse brain. Brain tissue from adult mice was dissociated into single-cell suspensions using the Neural Tissue Dissociation Kit (T) in combination with the gentleMACS™ Dissociator with Heaters. After the dissociation, the cell debris were removed using the Debris Removal Solution. NSCs were stained using the Adult Neural Stem Cell Sorting and Analysis Kit, mouse and sorted using the MACSQuant® Tyto® cell sorter. The MACSQuant Analyzer 10 was used for flow cytometric acquisition and data analysis. Neurosphere cultivation and differentiation assays were performed afterwards using the MACS® Neuro Medium and MACS NeuroBrew®-21 w/o Vitamin A. ▲ Note: Keep buffer ice-cold . For cultivation of neurospheres, it is recommended to dissociate SVZ tissue from at least 5 adult mice. Do not use the Neural Tissue Dissociation Kit (P) as the epitope detected by the Anti-GLAST (ACSA-1) antibody shows papain sensitivity. Enzyme T of the Neural Tissue Dissociation Kit (T) is ready to use. Prepare aliquots of appropriate volume to avoid repeated freeze-thaw-cycles. Store aliquots at –20 °C. This solution is stable for 6 months. Resuspend the lyophilized powder in the vial labeled Enzyme A with 1 mL Buffer A. Do not vortex. This solution should be aliquoted and stored at –20 °C for later use. Avoid repeated freeze-thaw-cycles. Thaw the MACS® NeuroBrew®-21 w/o Vitamin A at 2–8 °C prior to use. To obtain the complete neurosphere medium, add 2% of the MACS NeuroBrew-21 w/o Vitamin A (50×), 20 ng/mL Mouse EGF, 20 ng/mL Mouse FGF-2, and 0.25% L-glutamine (0.5 mM) to the MACS Neuro Medium. ▲ Note: Use the complete medium within 2 weeks when stored at 2–8 °C. Do not freeze. ▲ Note: Use ultra-low attachment plates for cultivation of neurospheres. For neurosphere differentiation, coat the culture dish with 0.01% poly-L-lysine overnight at 37 °C. Wash three times with ddH₂O. Let the culture dish dry under sterile conditions. It is recommended to use 5 mice for one experiment. Perform the dissection in D-PBS on ice. For more information about the dissection of the SVZ see Fischer, J. et al. (2011) Nat. Protoc. 6( 12): 1981–1989. Carefully remove the mouse brain. Wash the brain in ice-cold D-PBS. Transfer the brain upside-down to a 10 cm petri dish filled with ice-cold D-PBS. Separate the forebrain from the midbrain by cutting through the optic chiasm with a scalpel. Discard the posterior midbrain part. Perform a longitudinal cut along the midline to divide the two hemispheres. Carefully fix one hemisphere with one forcep by inserting it on one side into the cortex and on the other side into the striatum. Do not puncture the hippocampus, which is located between the white corpus callosum and the striatum. Use the spring scissors to cut around the hippocampus. ▲ Note: Do not cut too deep, since the SVZ is directly underlying the hippocampus. Take the micro-spatula to peel off the hippocampus. The stripped patterned SVZ is now visible in a brighter color than the surrounding tissue. Use the spring scissors to cut around it. Subsequently insert the spring scissors between the SVZ and the striatum, which is located directly underneath the SVZ, and remove the SVZ layers as purely as possible. Volumes given below are for starting tissue material from 5 mice (20–100 mg SVZ tissue). When working with less than 5 mice, use the same volumes as indicated. When working with more than 5 mice, scale up all reagent volumes and total volumes accordingly. A maximum of 500 mg tissue per C Tube can be processed. Prepare the appropriate volume of enzyme mix 1 of the Neural Tissue Dissociation Kit (T) (see above) and transfer it into a gentleMACS C Tube. Transfer SVZ tissue into the C Tube containing 1950 μL of enzyme mix 1. Transfer 30 μL of enzyme mix 2 to the C Tube. ▲Note: It has to be ensured that the sample material is located in the area of the rotator/stator. Run the gentleMACS Program 37C_ABDK_02. Centrifuge briefly to collect the sample at the bottom of the tube. Resuspend sample and apply it to a MACS® SmartStrainer (70 μm) placed on a 15 mL tube. ▲ Note: Moisten MACS SmartStrainer with buffer before use. ▲Note: When upscaling the reagent volume and total volumes, increase also the number of MACS SmartStrainers (70 μm). One MACS SmartStrainer (70 μm) can be used for up to 2 mL. Volumes given below are for the cell suspension from 20–100 mg SVZ tissue as starting material. When working with higher tissue quantities, scale up all reagent volumes accordingly. Cell suspension from 20–100 mg tissue can be processed in one 5 mL reagent tube. Always use pre-cooled buffers and solutions (4 °C). A swinging bucket rotor is recommended for centrifugation, e.g. Heraeus® Multifuge 4KR by Thermo Fisher® Scientific. Resuspend cell pellet carefully with 1550 µL of cold D-PBS and transfer cell suspension to a 5 mL reagent tube. Do not vortex. Add 450 µL of cold Debris Removal Solution. Overlay very gently with 2 mL of cold D-PBS. ▲ Note: Pipet very slowly to ensure that the D-PBS phase overlays the cell suspension and phases are not mixed. ▲ Note: If centrifuges give suboptimal centrifugation, the acceleration and brake can be reduced. Fill up with cold D-PBS to a final volume of 5 mL. Volumes given below are for up to 106 nucleated cells. When working with fewer than 106 cells, use the same volumes as indicated. When working with higher cell numbers, scale up all reagent volumes and total volumes accordingly (e.g. for 2×106 total cells, use twice the volume of all indicated reagent volumes and total volumes). Resuspend cell pellet in 80 µL of Tyto® Running Buffer. Add 10 µL of the FcR Blocking Reagent, mouse. Add 10 µL of the Adult NSC Staining Cocktail of the Adult Neural Stem Cell Sorting and Analysis Kit. Wash cells by adding 1 mL of Tyto Running Buffer and centrifuge at 300×g for 5 minutes. Aspirate supernatant completely. Resuspend up to 1×106 cells in 1 mL of Tyto Running Buffer. ▲Note: The MACSQuant® Tyto Cartridge can be filled with a maximal volume of 10 mL. Process immediately to sorting or analysis of NSCs. For details on the use of the MACSQuant Tyto Cell Sorter, refer to the MACSQuant Tyto user manual. For priming of the cartridge, refer to the MACSQuant Tyto Cartridge data sheet. Do not touch the microchip. Remove plunger from a 10 mL syringe with a male Luer-Lock . Store plunger upside down. Remove cap from the input chamber and attach syringe. Store cap upside down. ▲ Note: It has to be ensured that the propeller within the input chamber of the cartridge is located to the lower end of the shaft. Place a 20 μm nylon mesh filter (Pre-Separation Filters (20 μm), # 130-101-812) on top of the syringe. Apply cell suspension onto the filter to remove cell clumps. Discard the filter. Save an aliquot (e.g. 50 μL) as original fraction. Carefully place plunger on top of the syringe. 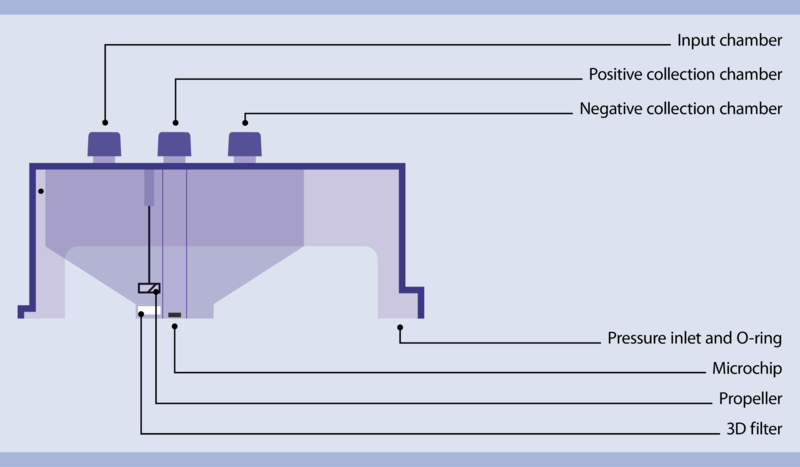 Flush out the sample into the input chamber by firmly applying the plunger at a rate of 0.5 mL/s. ▲ Note: Do not load the cartridge with a higher rate as cells might be lost in the negative collection chamber. Remove the syringe and reconnect the cap to the input chamber. Proceed with loading the cartridge into the MACSQuant Tyto cell sorter. Start the MACSQuant Tyto cell sorter instrument and software. Scan the 2D barcode on the MACSQuant Tyto Cartridge with the barcode scanner in front of the instrument. Open the lid on top of the instrument and insert the cartridge with the owl icon in the right direction. Make sure that the O-ring is placed on the air-pressure-line of the instrument. The cartridge is locked automatically. Instrument status indicator states blue. For detailed sort settings, please refer to the MACSQuantify™ Tyto Software user manual. Dot plot property: X-axis always backscatter (BSB-H). First, exclude all CD24-/CD45-/Ter-119-VioBlue® positive non-target cells. Set a gate on plexin-B2 positive cells in the PE channel. Afterwards, set a gate on GLAST+ in the APC channel for the sorting of plexin-B2+GLAST+ NSCs. After the sort has been completed, the MACSQuant Tyto Cartridge can be removed from the instrument and fractions can be removed. The target cells are contained in the positive collection chamber. 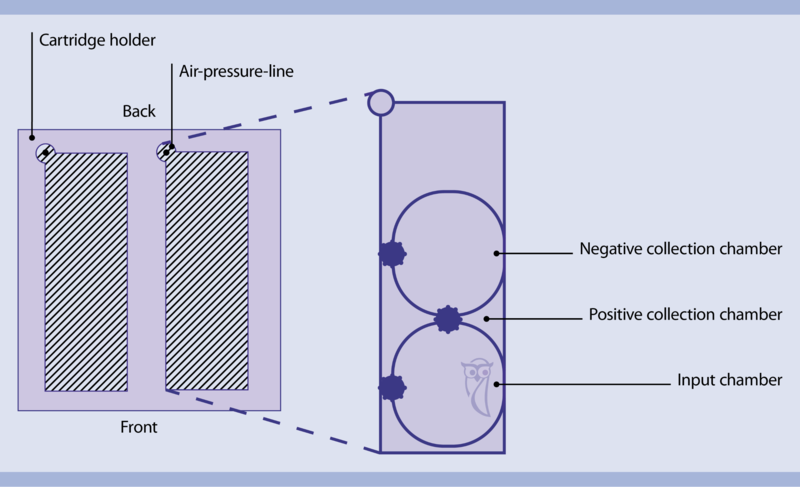 The non-target cells are contained in the negative collection chamber. For calculation of recovery and yield, the absolute cell numbers of each fraction (original, positive, and negative fraction) have to be determined. Assess the cell concentration either using a cell counter or the MACSQuant Analyzer 10. (Optional) When volume is <100 μL, pipet MACSQuant Tyto Running Buffer into the positive collection chamber by using a syringe or an extralong pipette tip. Resuspend the sedimented cells by pipetting up and down. Retrieve the full volume of cell suspension by using the pipette. (Optional) For optimal retrieval wash the chamber with appropriate volume of MACSQuant Tyto Running Buffer. Invert or vortex the MACSQuant Tyto Cartridge to resuspend the sedimented cells. Retrieve the needed volume (or complete sample) of non-target cells from the negative collection chamber by using a capillary pipet tip. Alternatively, the complete cell sample can be retrieved using a syringe. Therefore, screw a syringe to the negative collection chamber and invert the MACSQuant Tyto Cartridge. Pull the syringe plunger out to its stop to retrieve the non-target cells. Target cells are now ready for flow analysis using, e.g. MACSQuant Analyzer 10 or cell culture. Sorting performance of the MACSQuant® Tyto® cell sorter can be evaluated by flow cytometry using a flow cytometer, e.g., the MACSQuant Analyzer 10. Please refer to the MACSQuant Instrument user manual and software guide for detailed information on using the MACSQuant Analyzer 10. Make sure that the MACSQuant Analyzer 10 is optimally compensated for the analysis. Transfer a small sample of the target fraction to a tube for flow cytometric analysis; include also a sample of non-target cells to evaluate sorting performance. Analyze the samples using the MACSQuant Analyzer 10 according to the following gating strategy. Dissociation of subventricular zone tissue yielded 3.69×105± 9.3×104 cells per mouse (7–9 weeks old) with a viability rate of >97% (n = 12), using the Neural Tissue Dissociation Kit (T) and gentleMACS™ Octo with Heaters.This figure shows a representative analysis of the different fractions after exclusion of debris, doublets, and dead cells. Sorting of 3.69×105± 9.3×104 total cells resulted in 36,000 ± 8,000 GLAST+ Plexin-B2+neural stem cells with a purity of >95% and a viability rate of >93% as analyzed by propidium iodide staining (n = 6). Neurosphere assays are widely used to identify stem cells based on their capacity to self-renew and their ability to differentiate. Plate the positive cell fraction on ultra-low attachment plates in MACS® Neuro Medium supplemented with MACS NeuroBrew®-21 w/o Vitamin A, L-glutamine, Mouse EGF (20 ng/mL), and Mouse FGF-2 (20 ng/mL). Cultivate for 7–10 days until neurospheres of around 500 µm diameter are grown. Change half of the medium carefully every two to three days. ▲ Note: To assess the self-renewal capacity, neurospheres can be dissociated with the Neurosphere Dissociation Kit (P) and plated again for 7–10 days as described above. Transfer neurospheres to poly-L-lysine–coated glass-bottom plates using a pipette tip with a large diameter. Transfer as less medium as possible. Let the neurospheres settle down for 30 minutes. Add MACS Neuro Medium supplemented with MACS NeuroBrew-21 w/o Vitamin A and L-glutamine. ▲ Note: Do not add Mouse EGF and Mouse FGF-2. Differentiate neurospheres for approximately 7 days. Change medium every two to three days. Staining buffer: Prepare a staining buffer containing autoMACS® Running Buffer with FcR Blocking Reagent, mouse in a ratio of 1:10, e.g., add 1 mL FcR Blocking Reagent to 9 mL autoMACS Running Buffer. Wash cells 3× with paraformaldehyde (PFA). Add staining buffer and incubate for 10 minutes at room temperature. For intracellular staining: add 0.2% Triton™ X-100 and incubate for 10 minutes at room temperature. Add primary antibody in staining buffer to the cells and incubate at room temperature in the dark for 10 minutes. ▲Note: For co-staining with additional antibodies repeat steps 7–9. Mich, J. K. et al. (2014) Prospective identification of functionally distinct stem cells and neurosphere-initiating cells in adult mouse forebrain. Elife 2014: 3:e02669. doi: 10.7554/eLife.02669. Fischer, J. et al. (2011) Prospective isolation of adult neural stem cells from the mouse subependymal zone. Nat. Protoc. : 6 (12): 1981–1989.